A gift that everyone will love. 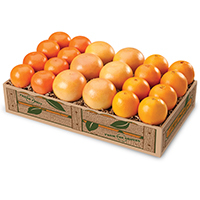 Three of our favorite citrus varieties- sweet Navel Oranges, Juicy Tangelos and Ruby Red Grapefruit together in one gift. As always, our fruit is picked at the peak of ripeness. Brighten their holiday, birthday, anniversary or any special occasion. Available: Mid-November thru Mid-January.